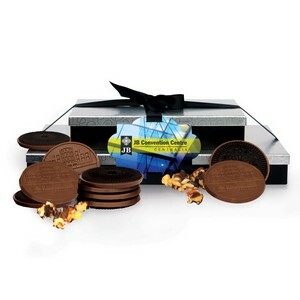 Great Business Food Gift idea!! Our Gift Tower with Chocolate Covered Cookies and Popcorn. Full-color, custom printed Tower Gift Bands now available! These custom gift towers are a cut above the rest. Tower includes: Funky Chunky Popcorn with pecans and 24 sugar, chocolate or oatmeal cookies topped with Belgian chocolate engraved with your artwork or custom logo. PACKAGING OPTIONS: Choose red, gold, silver, black or white box lids with our new full-color, custom printed tower gift band.